In the interest of history, I felt it would be appropriate to post up a few shots of the first ever map I released onto the internet. It was 1997. I was 14. Most of my days away from school were spent on my Dad’s laptop, hacking away at Doom maps using DCK, the map editor by Ben Morris, who created Worldcraft, which Valve bought, and then became Hammer. Everything dates back to Doom somehow. Everything. I had been editing Wolfenstein 3D and Doom maps for a couple years now, which were huge learning experiences, basically trying to create my own thing. It was so fun being able to change the games so easily, setting up traps and even altering the existing maps to make them more (read: less) fun. I made a good few ‘beginner’ maps, which I thought were fantastic, and promptly uploaded them to some BBS. I doubt they exist anymore. You were sitting down, in your home, just recovering from the battle you had with the Spider Mastermind at the end of Doom I. Suddenly, the lights in your room starting flashing. The TV screen was covered with static noise, and you could hear electricity sparking all over you. There was a green flash, and you appeared back on the moon. You stand there amazed, thinking that you had destroyed everything on your last visit. You’d heard tales of this place from your friends that lay before you, dead. If only you believed what they said, then perhaps you could have saved them. Too late now, but don’t leave all this for someone else to clean up, you must do it NOW. Thanks to my 7th and 8th-year English teachers for that. Their teaching helped me become a story writing genius. This is practically the first thing you see when you play the map. A window out to a courtyard with a lonely soldier stuck in the corner. Just in front is a large selection of barrels. Barrels in Doom were tremendous fun, especially in clusters like here. Shoot one, and the whole lot blows. Naturally the map had to start like that. 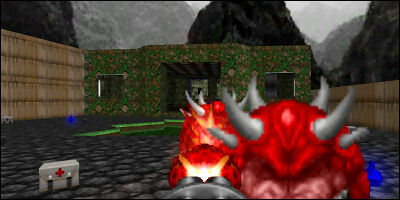 The obligatory outside bit, stlyed to match Doom 1’s first level ‘The Hangar’, but completely failing to retain the simplicity or style of Romero’s work. That said, check out the symmetry -that’s right, a hint of design sense. 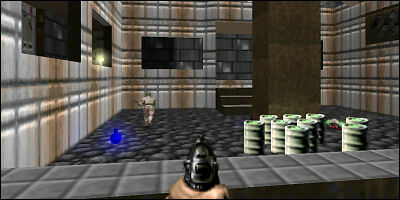 The final ‘room’ of the level. A large, watery place inspired (I think) by Strife and probably Heretic too. It’s also probably the best part of the entire map, with a sense of order and purpose about it. There’s even a funky Doom-style lighting effect, trying to forge light dampening out with distance. As traditional, it was very dark. 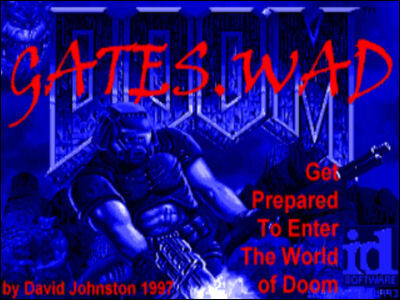 So that was Gates, a Doom 1 map I uploaded to cdrom.com in 1997, and still available on the web today. How time flies.